Over Chateaux 406: wit zandstrand met groot verwarmd zwembad, korte loopafstand van een heel scala aan goede restaurants, een eigen parkeerplaats onder gebouw en in de buurt vele toeristische trekpleisters. Dicht bij Tampa Bay / Clearwater / St. Petersburg. Faciliteiten: Groot balkon af van de woonkamer op zoek direct uit naar het strand. 2 Kleur TV's en een dvd-speler, centrale A / C, kabel, telefoon. Dit zeer ruime appartement beschikt over een comfortabele slaapkamer met een queen size bed en een dubbele futon off van de woonkamer. Alle beddengoed / handdoeken ingericht. Volledig ingerichte keuken, inclusief magnetron en vaatwasser. Activiteiten: Openbare tennisbanen overkant van de straat in het Stadhuis. Golf resorts in de buurt. Johns Pass slechts 10 minuten ten zuiden van Chateaux over Gulf Boulevard. Gebied: Chateaux gebouw dat onlangs gerenoveerd, nieuwe verf, nieuwe strand, ziet er prachtig uit. Indian Shores Beach heeft brede zandstranden, lopen mijlen in beide richtingen. SCHOON! Wij zijn trots op onze verschijning ...: Denk eraan, 'als je die reserveren, u kunt komen en genieten van onze zand, schelpen, zee, en Sizzling Sunsets bij' The Sea of ? ?Love ', de kastelen op Indian Shores Beach. My husband and I had a wonderful time! We can’t wait to go again! The place was awesome! We couldn’t spend enough time on the balcony enjoying the beautiful view! The condo was clean and had everything you could need without a lot of unnecessary clutter. It was nice having linens, beach towels, beach chairs and umbrellas provided since we had to fly. Tina was great to deal with. We will definitely be planning a trip back again soon! I am so thrilled to hear you and your husband found everything you needed in the Chateaux condo during your stay and that you had an enjoyable time! I wholeheartedly agree, the balcony at Chateaux is my favorite too! Thank you for taking the time to write to me and I look forward to hearing from you again in the near future. Perfect beach vacation! Condo was very nice and clean. Exactly as described. Amazing view. We loved the location and the laid back atmosphere away from the crowds. Short drive to Clearwater Beach if you want to go for the day. We would absolutely book again. Thank you so much for such a stellar review! I'm always so happy to hear my guests have enjoyed their vacation and found everything to be exactly as described. Indian Shores does offer the best of both worlds. 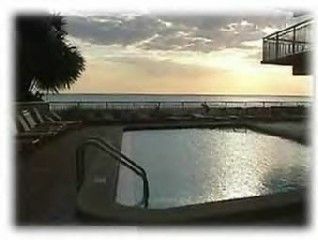 We are still a quiet family area beach with a 2 lane street, one each way...and it is only a 10 minute drive in either direction to get to our busier beaches, that have 2 lanes of traffic each way, either St. Pete Beach or Clearwater Beach. I look forward to hearing from you again in the near future as you were such wonderful guests! Enjoy the rest of your summer! I'm so very happy to hear your family enjoyed your stay at Chateaux 406 and found everything in the unit you needed for a comfortable stay. Thank you taking the time to write to me. Chateaux is my favorite unit as well...the beach is just right there! It was a pleasure having your family as our guests and I look forward to hearing from you again! Always so nice to hear that a guest has enjoyed their stay at Chateaux 406 and found it to be everything they had hoped! I hope you have a wonderful summer and hope to see you again in the future! The shower unfortunately has little pressure and the bed has valleys. My husband developed back pain so I let him sleep in the centre and tried the futon, which was horrible. I'm so happy to hear you found the view and condo amazing! The walk in shower has a high tech shower head ...had I known you were having trouble using it when you were here, I would have been happy to come over and show you how to adjust it. The mattress is the new hybrid style mattress that combines the buoyancy of an innerspring core with the motion isolation of memory foam and came highly recommended to me, as it appeals to the majority of the population. I am sorry your husband did not find it as comfortable as you. So happy to hear you enjoyed your stay at my Chateaux 406 condo! Yes, watching the waves roll in from the balcony there, is one of my absolute favorite things to do. Have a wonderful upcoming summer! Direct Gulf Front Condo op Indian Shores strand, slaapt een kleine familie van 5-6 comfortabel, recentelijk gerenoveerd gebouw, zwembad aan het strand, gereserveerde parkeerplaatsen, winkels, restaurants in de buurt, genieten van zonsondergangen vanaf een eigen balkon. Volledig ingerichte keuken, muntjes wasmachine en droger in de gebouwen. Geniet van beschietingen, zwemmen, strand wandelen, Chateaux, 'Sea of ? ?Love' condo ... dicht bij Johns Pass. Indian Shores Beach is gelegen tussen Clearwater Beach en St. Pete Beach. Vang de trolley-service net voor de deur en rijden op en neer Golf Blvd. voor een nominale vergoeding.